Submit a Testimonial or Experience! Have something you want to tell us about your experience? We want to hear about it! The good, the bad and the ugly (although we strive to make sure the last two don’t happen!) Glowing reviews are always appreciated, as is a recommendation to a friend! You can leave reviews on our Wedding Wire page too! The Cover Girlz is not just about chair cover rentals, we are a chair cover service. 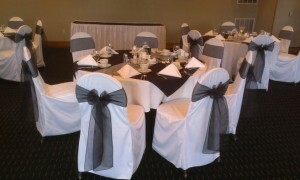 Chair Cover and Sash installation and pick up under $4.00 each. Showroom visits are by appointment only, contact us by phone at (216) 214-2259 or use our online contact form. We'll follow-up with you promptly to schedule a time with you! Download Our iDo Decor Design App Today!